Here is a great deal on the Smoktech Telescopic Mod. This is the lowest price I have seen since Cybermonday. The All New SMOKtech TELESCOPE™ Battery Mod – eGo Compatible. This unit is not meant for stacking batteries, please be careful as you should with all ecig mods, use the proper batteries and make sure to never let them drain all the way down.manufactured from high quality aircraft grade 20/24 aluminum so it is light in the hand with the perfect amount of heft. No suffering from wrist fatigue when you use this item. 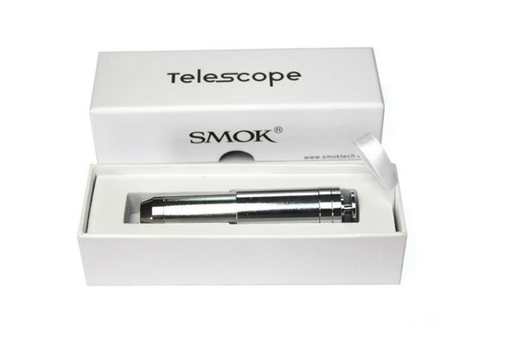 The TELESCOPE™ is just that, a telescoping mod that adjusts its size and profile depending on the battery used. It can accept many different lengths of batteries from short to tall including the 18350, 18500 and 18650 and others. You insert the battery into the tube (positive side up) then screw in the top being careful to thread evenly. You then screw down causing the mod to collapse into itself providing you with an extremely pocket friendly bullet-sized look when using a smaller battery such as the 18350 and it telescopes up from there. The inside of the battery holder tube is well tooled with silky smooth threading extending its entire length. The TELECOPE™ is a fully mechanical mod, no PCB circuitry or wires of any kind. A push-button trigger disc at the bottom of the mod completes the ciruit, injecting a brass firing pin against the negative side of the battery, completing the circuit and firing your mod. The finish on the TELESCOPE™ is high-gloss chrome. Some tips & info when using the TELESCOPE™:Snugly thread the top into the tube for best connection of your battery. If you find you are not firing as well as you should simply give the threading an extra twist or two.LOCKING FEATURE: Screw down the bottom ring when you want to place the TELESCOPE™ in your pocket or purse. This effecively locks the firing button/disc on the bottom and thus turns the unit off.There is no need to worry about placing the TELESCOPE™ upright on your desk as there is plenty enough tension with good high quality springs (not too tight, not too loose) inside the unit that will not cause it to fire in an upright position. Use the locking feature only when you want to disable the TELESCOPE™ from accidentally firing when not in use.eGo Compatible! Using an eGo Clearo/Carto or Tank? No problem! NO EGO ADAPTERS NEEDED. The TELESCOPE™ features a 510 connection and this connection is surrounded by an eGo well. You can utilize any of your Vivi Clearomizers, ego C and T Atomizers, J-Tanks Etc. on the TELESCOPE™ natively! Keep your TELESCOPE™ looking streamlined and GORGEOUS.